The mild steel flange mount disconnect floor standing enclosure range, MCF, is available off the shelf in various sizes. It is equipped with a predefined cut-out, which reduces machining time, on the right hand door, that can be matched with most of the common switches in the market. The enclosure configurations that may be created comply with door interlocking and main switch regulations. Mounted with four hinges. Including door frame with 25 mm hole pattern. Door can not be reversed. Flange door: Surface mounted with hinges, locked from the inside, including universal cut-out. Lock, left door: Espagnolette 4-point locking system. Does not interfere with the enclosure inner space. Standard double-bit lock with 3 mm insert. Standard inserts, cylinders, lift handles and T-handles are available as accessories. Lock, right door: Top and bottom lock with double-bit for easy opening of the door. Double-bit 3 mm insert and 90° movement. Other inserts are available as an accessory. Double folded and adjustable in depth by steps of 25 mm, with the MPD02 accessory. Supplied, attached on the outside of the enclosure packaging. Standard delivery ready for combined installation. Sides of the group of combined enclosures must be closed with side panels SPM. To complete the intelocking system add FMD in this master enclosure and FMA, FMB, FMS in the slave enclosures. Frame with fitted doors, rear panel, roof panel, bottom plates, mounting plate and door frame. Delivery also includes earthing bolts. Delivered on a pallet which is identical to the width of the enclosure to allow baying without removal. All packing material is recyclable. Mild steel combinable flange mount disconnect floor standing enclosure with defined universal cut-out on the right hand door as standard, in order to install a main switch handle. A flexible solution where customers can choose enclosures that meet their size requirements, off the shelf, in order to create enclosure configurations made up of smaller individual enclosures. The predefined cut-out reduces the customers machining time and can be matched with the most common switches in the market. Customers can receive enclosures with a short delivery time, that match their size requirements. 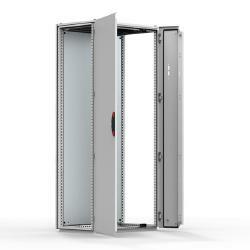 Enclosure configurations can be created that comply with door interlocking and main switch regulations. If the Flange Mount Disconnect enclosure is to form part of a larger enclosure configuration where the doors are required to be interlocked, accessories, FMA, FMB, FMS and FMD are required.